Learn how to configure your OpenOffice.org menus and toolbars to resemble Microsoft's user interface without worrying about copyright woes. One of my blog readers reports that, when he migrated his organization to OpenOffice.org, he didn't even tell the users that they were switching to a different office suite. He just said that there was going to be a big upgrade. Then, he and his migration cohorts modified the OpenOffice.org menus and toolbars to resemble the Microsoft Office layout and phrasing as much as possible (without violating copyright, of course) and gave that configured version to the users. He reports very few problems with the migration. I love that story. Is the biggest problem with change simply that it is change? If you think that you're using a drastically upgraded version of Microsoft Office, will you be as upset by changed features and minor formatting problems between documents? It's an interesting idea, at least. Obviously, awareness of change is not the only issue at hand. OpenOffice.org and Microsoft Office are definitely different, and a switch does require some relearning. But it does beg the question: how much of the difficulty in migrating to OpenOffice.org, both real and imagined, can be reduced by simply using the extensive configuration tools at our disposal to make OpenOffice.org look like Microsoft Office? And why stop there? 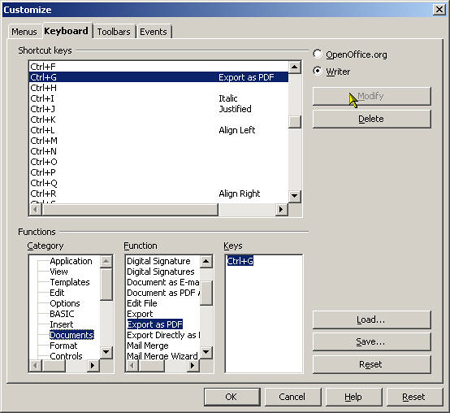 You could create additional menus and toolbars to make work easier with OpenOffice.org: create specific toolbars for each department with the most commonly performed functions; add menus for who to go to for help; remove items that are confusing or irrelevant; and so on. OpenOffice.org is amazingly configurable. Adding or removing menus, changing order of menu items, changing what the items are called...it's all very easy. The same goes for toolbars. Here's a little something I did in about a minute with my own installation of OpenOffice.org. Before I get into the specifics, I realize you might be wondering about a few things. I've looked at the EULA and documentation online, and from what I can tell, Microsoft owns the appearance of its icons. But the company doesn't own exclusive rights to things like the phrase "Print Preview," so you should be fine renaming icons and making menu items appear in the same order as in Word. Of course, I am not a lawyer and don't know for sure, so you should do a little research on your own as well. Do I have to make these changes on everyone's computer? Not really. You do need to set up all of your users to use the same menu configuration files on the server or copy the edited configuration file to everyone's computer. Either way, it's not a huge amount of work if you have good system management tools. Let's move on to the fun part: doing the customization. Here's how to create a new menu or toolbar. Choose Tools > Customize. Click the Menu or Toolbar tab. Click Add, and name the menu or toolbar. 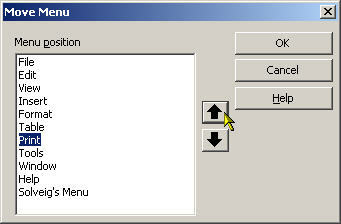 Click OK.
For menus, click and hold down the Menu button and choose Move. Use the arrows to move the menu to the location where you want it. Click OK.
Now it's time to add the items. Click on the Add button. You'll see the Add Commands window. The items aren't easy to find, so you'll need to explore the categories. Select an item and click Add, and keep going until you've added all the items you need. Then click Close. In the Customize window, change the order of the icons if you want. Select an item and click the up or down arrows. Now you're ready to use your new menu or toolbar. To view the menu, just look for it on the menu bar. For toolbars, choose View > Toolbars > Toolbarname. You can change the name of any menu or toolbar you've created, and rename any item on any menu or toolbar. 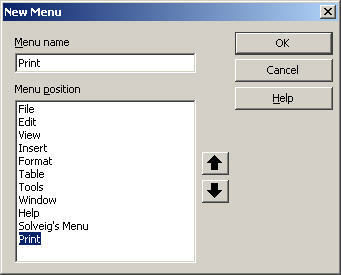 Renaming a menu or toolbar Choose Tools > Customize. Click on the Menu or Toolbar tab, and select the menu or toolbar to change. To change the name of the menu or toolbar itself, click and hold down on the Menu or the Toolbar button and click Rename. Type a new name and click OK.
Renaming an item Choose Tools > Customize. Click on the Menu or Toolbar tab, and select the menu or toolbar to change and an item. Click and hold down on the Modify button and choose Rename. Type the new name and click OK.
Changing icons For toolbars, you can change the icon for each item. Select the icon, click and hold down on the Modify button and choose Change Icon. In the icons window that appears, select a different icon. Click OK.
You can choose your own graphic for the icon. The graphic has to be 26x26 pixels and in .png format. Note that this is the size for the small icons, not large, and it's the size for all icons in this window, not just the ones you add. If you have set up your icons as I have with the Large format under Tools > Options > OpenOffice.org > View, the icons won't be that size. Power users, or anyone used to certain keyboard shortcuts, will appreciate retaining those shortcuts through a migration. 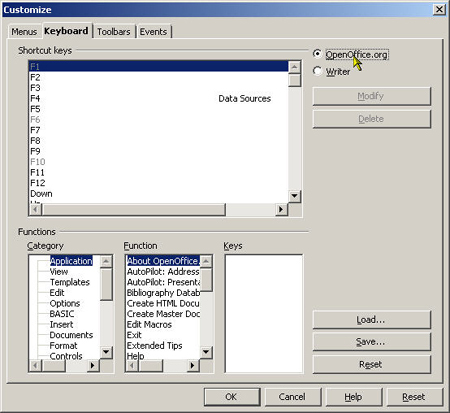 Choose Tools > Customize and click the Keyboard tab. Choose whether these keyboard shortcuts will apply throughout OpenOffice.org or be restricted to the current application. Again, you're looking through a set of functions with a somewhat complex organization. But find the function you want, then the keyboard shortcut you want to use and click Modify. The function will appear next to the shortcut. The settings in this window, for individual modules, are saved in the soffice.cfg\\modules\ \modulename\\accelerator\\language\\current.xml file. To go back to normal, just choose Tools > Customize, and click the Reset button. 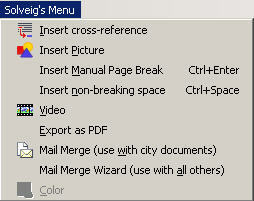 The information about toolbars and menus is stored here; under Tools > Options > OpenOffice.org > Paths. On the computer where you did the configuration, find these files. Use the window above to find out where those files are stored. The files that are affected depend on the configuration you've done; however, you'll probably want to just copy the whole soffice.cfg directory. 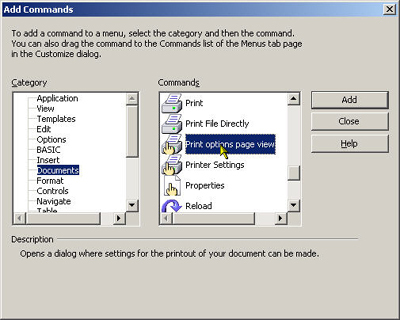 Copy the directory to the appropriate location on each user's computer, according to the settings for configuration under Tools > Options > OpenOffice.org > Paths. I like teaching toolbar configuration in class, because it's one of those features that's both useful and fun. There's an enjoyable feeling of power that comes from totally changing how an application looks, in a matter of minutes. Now, I'm sure that none of you out there will abuse your new configuration power, such as by writing a macro that would play a song from "South Park" every time a user types a certain key combination. But if you decide to do it, you didn't get the idea from me.